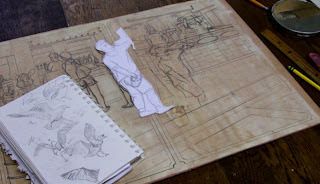 Had a long drawing session in the Studio this afternoon, making a lot of progress on the latest block. The first thing I did was make a few changes with the family group I drew last time. 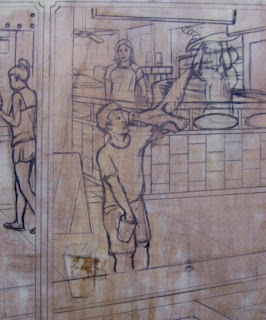 Some minor changes to the guy holding the sandwiches, but a major change to the kid. I redrew the character so that now he faces more forward, which is how he appeared in the earliest paper sketches. He needs more work, but based on what I see here, he will remain in this position. His mother's arm moves from his collar to resting on his shoulder. I changed the angle of the arm of the man behind him (attacked by gull), so that the cup of fries he's holding is more visible. 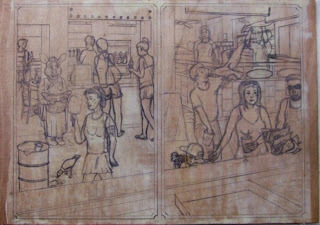 The next task was to finish the foreground. I put in the various condiment containers on the counter, then all the food on the grill side of the counter. (from left to right- tomato sauce, rolls, sausage, grilled onions and peppers) The changes can be seen in the above photo. Molly arrived to work on some silk screening, and I continued drawing. I fixed a few things in the back of the pizzeria- what's visible through the rear window and some things behind the counter. 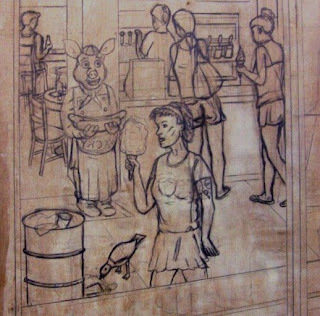 Then I moved on to some of the details- the boards of the boardwalk, the Tillie design on the cotton candy girl's t-shirt, and I started roughing in some of the signs found on the back wall businesses. Molly liked the changes to the drawing since the last time she had seen it (the September critique), noting that the images in the series seem to be getting a bit more wild with each new print in the series. She particularly liked the guy attacked by the gull and suggested that I should have more unusual characters. This one is full, but there will be in future prints. Below is the whole block as it exists right now. I should have the drawing done in time for the October critique. Today's task was to put in a family group in the lower right corner of the block. I put in the woman first, then the kid (with a pretzel) she's grabbing by the shirt collar. Last was the guy holding a sausage and pepper sandwich in each hand. All 3 will need some refining, but this is pretty much what I had planned. These are the last of the planned figures, though there are still many things to add. Below is a view of the whole block so far. One of the things that attracted me to the boardwalks as an artistic subject matter (and attracts a whole lot of visitors in general) is the sense of spectacle. Lots of color, light, sound, energy. Crowds of people, piles of prizes, tempting treats wherever you look. In all the prints done so far in this series nothing has been exaggerated- haven't needed to. I start with a concept, make notes from memories, do additional on-site research, then combine all this in the composition. I feel that in this environment the truth is interesting enough and the art is what I choose to include and how I present it. At the last critique one of the group noticed a few lightly pencilled curved lines and asked if it represented a bird. I told her that it did, in this case a sea gull picking at trash spilled around the base of a garbage barrel, a fairly common sight on the boardwalks. 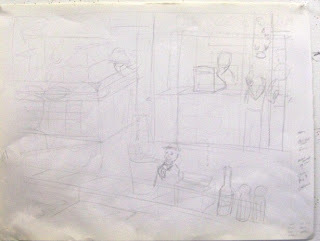 (and this scene was fully drawn in a few days ago) It was then suggested that I should put a gull standing on the counter in the foreground. I suppose it possible that such a thing could happen, but I've never seen it happen and it seems unlikely, so I think of it as an exaggeration. On the other hand, a gull swooping down to grab some food out of the mouth of someone walking on the boardwalk, that's something I have seen. 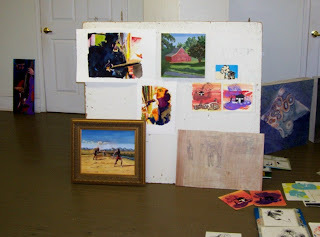 (several years ago in Atlantic City, near the food stands by the Taj Mahal) So that was what I worked on today. 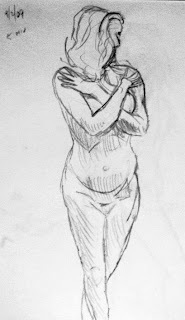 Used a mirror to figure out the basics of the slightly twisted pose, and sketched it on paper. I had an idea of where the guy would be, but I wasn't sure, so I cut it out and moved it around the right panel, facing right and left. In the end I put it more or less where I had planned all along. As for the bird, I had collected a whole bunch of gull reference sketches a few years ago when working on my tower piece, only some of which made it into that piece. I chose one in a suitable pose and put it in the proper relative position, snatching a french fry from the guy's mouth. The bottom sketch shows where I ended up. The legs are not necessarily finished, since I expect another figure or something on the foreground counter may block part of the view of them, possibly saving me from having to deal with them. Put in a few more hours on the block this afternoon. First order of business was making the pig look a little more like the old WCP comic character. (the pig's appearance tended to change from panel to panel and issue to issue, but this is close to the original model sheet) Most of the time was spent adding the cotton candy eater, based on the sketches I did last month. I made a slight change to the position of the arm holding the cotton candy to make it fit in the space a little better and added a simplified version on her sweets-themed tattoo to the other arm (in the final print this will put it on her correct arm), but otherwise it was pretty much a straight copy. Then I decided to go ahead and put in something that was planned, a large garbage can full of trash, along with a gull picking at spilled trash. I'll eventually go through and make adjustments, but this finishes all the major figures on the left side. There will be some condiments and related items on the counter in the foreground, but I'm going to wait on that until I'm ready to do the whole counter. All the signs and other details will be done after that. Got into the Studio for a while today. After several days of looking at the current block I decided that there were some perspective issues I had to deal with. 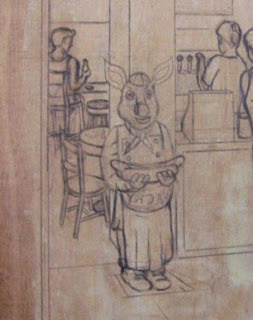 It was the pizza place that was bothering me most, that counter going back to the dining room. The angle was all wrong, implying an elevation. The new version (seen above) isn't perfect, but it's much better. The next thing was adding another figure along the back wall. 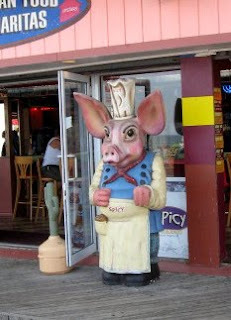 Anyone who goes to Seaside probably is familiar with the large pig statue in front of the Spicy bar/restaurant on the boardwalk. Almost as tall as an adult, molded in fiberglass or something similar, and kind of scary looking. How can I not make it part of this print? At first I was going to put it in as is, but nothing else in this series has been taken directly from reality, so I'm making it a little different. I decided to make him look a little more like a much older creation of mine, Wacky Castrated Pig. Less scary, more wacky. I'm keeping the body and clothing of the original, but switching the chef's hat for Wacky's traditional beanie. And the pig face will look a lot more like Wacky's. The other change is that the original has empty arms/hands, while in mine he's holding a giant hot dog. I did this sketch from memory, but later I'll bring a copy of the comic book with me and get it exactly right. 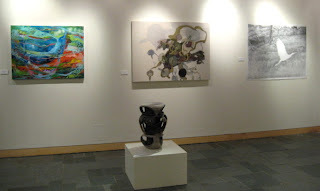 This afternoon we had the opening reception for the new Kean Fine Arts Adjunct Faculty Exhibition. Most of the 30 participants came in for the event, even though most of us were not actually teaching today. Many of the department's full time faculty also attended the reception, along with some students and other assorted visitors. My piece, shown being viewed above, received many compliments, and I was asked to explain it by more than a few in attendance. 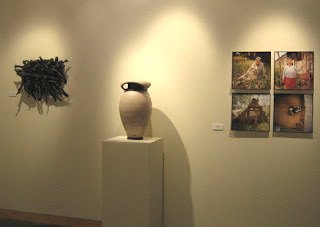 Below are more photos of the exhibition, showing the variety of work that was chosen by the participating artists. The adjuncts tend to only come in on days and times when they have classes (the rest of the time there's a good chance we're off trying to earn some money somewhere else), so these occasional shows are an opportunity to meet some of our colleagues for the first time, or to see some whose paths we haven't crossed for a while. And the art is pretty cool, too. 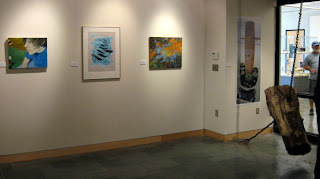 The show remains up for another 5 weeks, so people on campus will have plenty of time to see it for themselves. It's been six weeks since the last critique at the Studio, so it was likely that everyone would have something new to show. 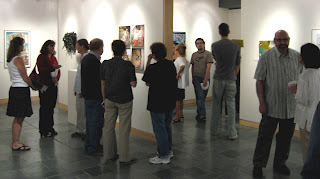 We had 9 artists bring art to show tonight, including one who was a first time visitor, plus a few others who were there just to watch and comment. Between the crowd and the relatively large size of some of the artwork, we decided to move everything down the hall to the cafeteria. (there was a lot of activity in our building tonight, but what was coming from the theater over our heads was not so loud as to disturb our discussions) With a firm time limit for each artist we were able to get through everyone within the planned two hours. 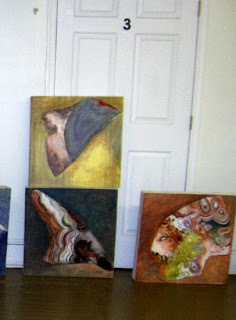 More of Jane's paintings of stones. Sculptures from Adam and Vince. 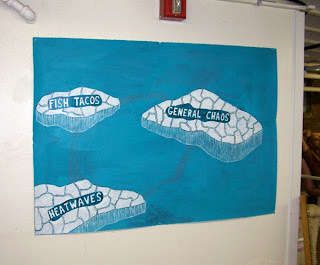 Dahlia's large acrylic on paper, summing up this past August. As always, it was a fun and productive evening for all involved. It happens every month down in our basement. My first week of school now over, I can spare a little time to get back to art. Today I decided to deal with some of the figures in and near the locations I worked on last time. I put someone behind the counter of the ice cream place, filling a cone at a frozen custard machine, and two people in front- one with a cone, one waiting. They need a little work, but this is more or less what I planned. 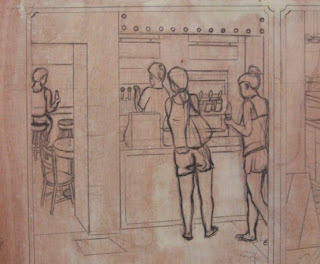 The woman with the large bag will likely be at least partly obscured by another figure walking between her and the counter in the foreground. 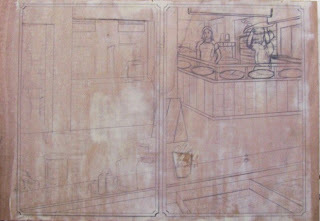 I also roughed in a guy sitting at the bar in the place to the left, but he needs a lot more work. 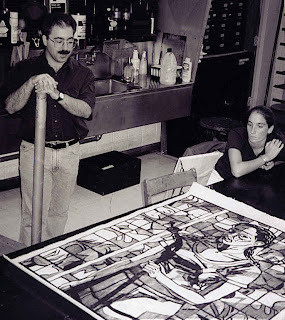 This October I'll be holding my Introduction to Woodcut workshop at the Printmaking Council of New Jersey in the Somerville area. It's a full weekend of woodcut fun. I'll show lots of examples of relief prints (mine and from my collection of work by other artists) and demonstrate how to cut and print wood blocks. The workshop also covers multiple block printing and other more advanced possibilities in the medium. Students will get to try it for themselves with me around to provide advice and assistance. The course is considered suitable for NJ professional development credits. 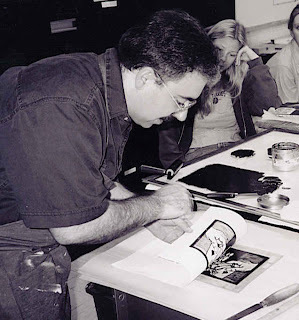 The workshop will be held the weekend of October 17th and 18th, with the class running from 10:00 to 4:00 each day. Participants must sign up in advance. More information can be found here on the PCNJ site. 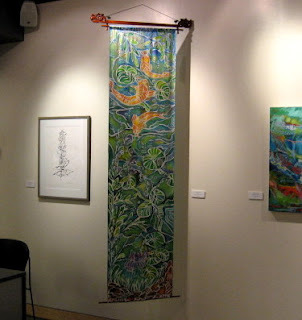 Today I dropped off the above piece at Kean University as my contribution to the Adjunct Faculty Exhibition. 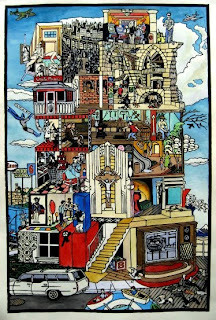 It is a hand colored woodcut called A History of Art, completed early last year. 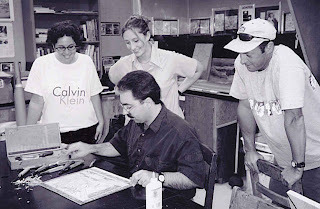 The story behind the print can be found here, and anyone with too much time on their hands can see the whole process from start to finish in the blog archives from June 2007 to February 2008. 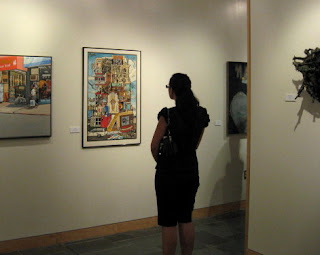 The exhibition opens with a reception on Tuesday, September 15, from 4:00 to 6:00 pm. 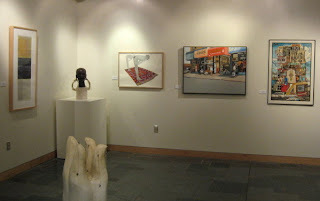 The show is at the James Howe Gallery in the Vaughn Eames building on Kean's campus in Union, NJ. 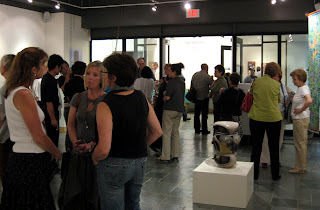 The show remains on display through October 23, 2009 during gallery hours. If I can find out what those gallery hours will be, I'll note them here. Getting to the Studio this past Saturday had been a bit of a challenge- the normally overcrowded beach town was extra overstuffed with visitors for the Labor Day weekend, and some of these people found their way to my building's parking lot. I was lucky to grab the one space available (out of about 30), and there were at least a dozen cars parked in the dirt and gravel lot behind the building, in the space where the annex had been. Fearing more of the same over the next few days, I brought the block home with me to work on, since pencil drawing on a medium sized block can be done anywhere. Today I got back to work on it. I added a little more to the pizzeria on the right- patterns on the counter facing and floor, and an overhead fan in the back of the restaurant. Mostly I was working on the left side. The bigger space is an ice cream stand, and to the left of that is a bar/restaurant of a type common to the boardwalks. Both locations will get figures in and around them, so I'm going to hold off on further detail and signage until I see what space is visible around the people. Back to the Studio for a few hours today. 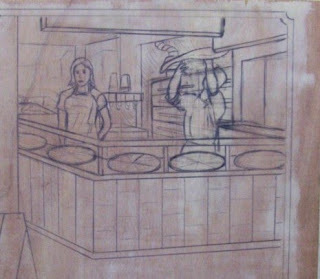 Last time I had mostly worked on the structure of the pizza counter. 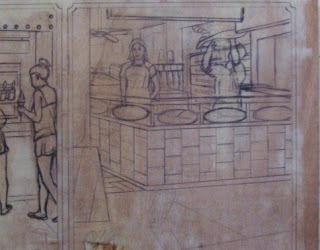 (this pizzeria is based on a sketch of a particular location in Seaside, but all the pizza places share a similar layout, so this one can represent any of them) I cleaned up those lines, then moved on to the pizza ovens, the inner counter (which includes the soda tower), and a little bit of the back dining room. 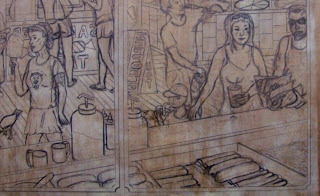 I decided to go ahead and put in the two figures behind the counter, which ended up covering some of what I had drawn today, but that was expected. Eventually I'll go in and make a few adjustments and add some detail, but for now I have one finished space, as seen in the top photo. The bottom photo shows it place in the whole composition. 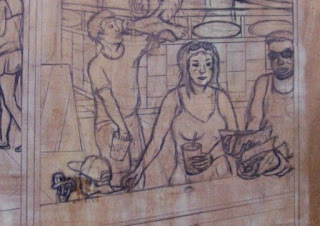 The other eateries along the background will be designed to relate to the pizzeria in terms of scale and perspective. Was briefly in the Studio this afternoon, travelling from one place to another. I took a look at the new block. 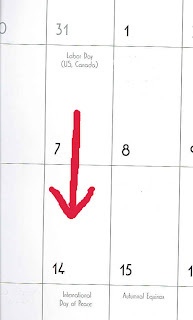 As I mentioned last time, the first day's results had all sorts of perspective problems. As a rule I don't use linear perspective systems to line up all the items in a composition. While they do bring order to a composition, it can be accompanied by some significant distortions. Early Japanese woodcuts tend to use oblique and isometric projection systems, which employ diagonals with identical angles, flattening the surface. I decided that was not a way I wanted to go. (later Japanese woodcuts show the influence of one and two point linear perspective systems, so this option is not without historical precedent) What I end up doing in all my prints is using some of the tricks of perspective, but not forcing all the lines to meet vanishing points. It seems to work for me. But that doesn't mean that anything goes either. Just as perspective systems can help clarify and define 3D space on a 2D surface, inconsistent perspective can really confuse a composition. So I don't need perfect perspective, just one that's not going to make things worse. 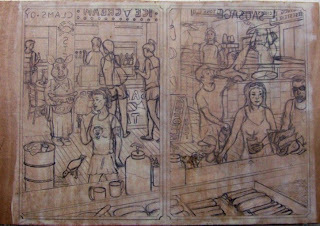 If I was just copying a particular existing boardwalk scene it would be easy enough, but I'm making something up, pieced together from sketches and photos from different viewpoints on different boardwalks. Today I made some minor adjustments to the two places in the left panel, but the right side, with a projection back into deep space, will be more of a challenge. I made some changes that improved on the first day's work, but it's not quite there yet. Not enough done today to be worth showing here; I'll have a photo when I've got it figured out. With several days left before Labor Day, it's still summer around here, so it seemed appropriate to sit in on another night of figure drawing in Belmar. We had a first time model, friend of another one of our models (who came with her and drew tonight), but she did just fine. My charcoal drawings were better than last time, but pretty much like all the other charcoal drawings I've posted here over the past few years, so I'm putting up one of the 5 minute pencil sketches. When I was a little kid, if you asked me what the best things were about the boardwalk, I would likely have said in this order- rides, games, and food. I will eventually devote one of these Floating World prints to rides (meanwhile we've seen pieces of some in the first print of the series and my tower print from a few years ago), and games have been pretty well covered between that first print and the recent arcade print. But now it's time to do one dedicated to food. In my youth we usually went after dinner, so eating was mostly treats like ice cream. If something more substantial was desired, there were things like pizza slices, or sausage and pepper sandwiches. What else? Pretty much anything that you might find at a typical county or state fair anywhere in the country, plus all kinds of seafood, Italian foods and other regional favorites. If it tastes good and is bad for you, it's on the boardwalk. Like the previous prints, I'd made notes and sketches of things that will go into this when I started planning the series a few years ago, and last month I started working up a full scale compositional sketch, seen in the top photo above. In order to put in as many different foods as possible, I will have a food stand counter in the foreground, a variety of typical places across the boards in the background, and some people in between (such as my cotton candy eater) holding/eating some of the other foods. My visit to Seaside last week got me a few more details. 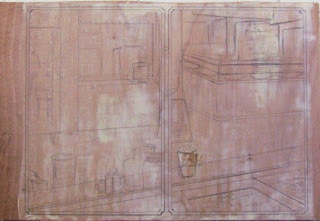 Today I took one of the prepared blocks, put in the border lines of the two panels, and started roughing in the basic structures. I think the basic proportions are ok, but I need to do a bit more work to bring the perspective into some kind of consistency. When I get that finished, I can start working on the details, put in the figures, etc. Normally we hold the Social Animal Press critique group on the first Monday of the month, but this month that Monday is Labor Day. Wouldn't make that much difference to me, but we're thinking a lot of people will be busy with other things that day, so the crit will move to the 2nd Monday, September 14, at the usual time. It will go back to the first Monday in October.